Hi;Have a slight problem!In trying to remove rear brake dums ruined both axles mushroomed them.In view of needing both axles and one drum thinking might try to find a complete rear end.COuld I use one from a regular Zephyr.As long as it was ODthe ratios should be the same?Wonder if driveshafts are different lengths thought but would be simple to switch mine to the rear end.HOw hard is it to remove the axles as might be able to get a machine shoptorepair the threads on there lath.Thanks for your thoughts!! Here's a picture of the K.R. Wilson hub puller in action. It turns pulling Lincoln rear hubs into kid stuff (an air wrench helps a lot)! I got mine from Winfield Tools and I highly recommend them AND the puller! Rear axle assemblies are the same and interchangeable for Continentals and Zephyrs 1941-48. Standard gear ratios are 4.44:1, with or without OD. Driveshafts are different lengths depending on whether the car has the Borg-Warner transmission overdrive or not. The overdrive unit adds about 16 inches to the transmission length. A good source for mechanical parts is Merv Adkins, 9655 Hidden Farm Road, Rancho Cucamonga, CA 81737 Phone (909) 980-1332. 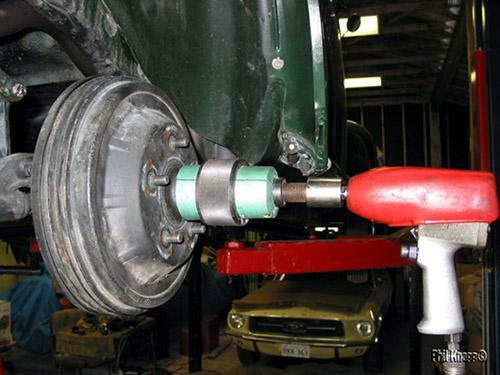 Merv is listed in the Lincoln Zephyr Owners Club roster and usually has axle shafts and brake drums in stock. May I suggest that you join the LZOC (if you haven't already done so). There's an on-line application form at www.lzoc.org. Removing the axle shafts requires dis-assembly of the whole rear end, not a trivial task, and is best done with the rear end out of the car. After you price the cost of new axles you might want to reconsider having the axles repaired.Either way you must remove the axles and to do this you must remove the drums. To remove the drums file the mushromed ends down to the same diameter as the undamaged threads and then use the proper drum removal tool. When you remove the axle housings, you must use the same thickness of gasket between the axle housing and the ring gear housing on both sides or you will upset the backlash of the ring and pinion gears.